3 director or assistant director of a medical records and health information department in a small facility. However, in larger institutions, the director usually is an administrator with a bachelor's degree in medical records and health information administration. 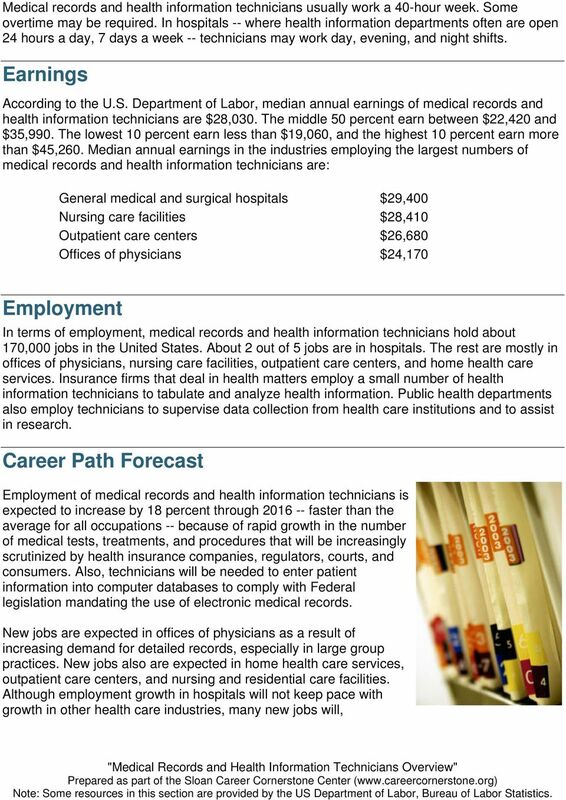 Hospitals sometimes advance promising health information clerks to jobs as medical records and health information technicians, although this practice may be less common in the future. Advancement usually requires 2 to 4 years of job experience and completion of a hospital's inhouse training program. 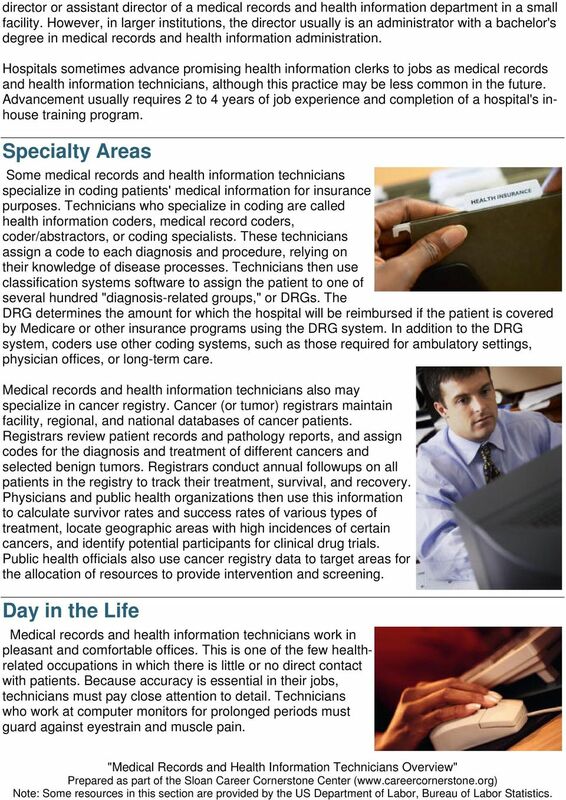 Specialty Areas Some medical records and health information technicians specialize in coding patients' medical information for insurance purposes. 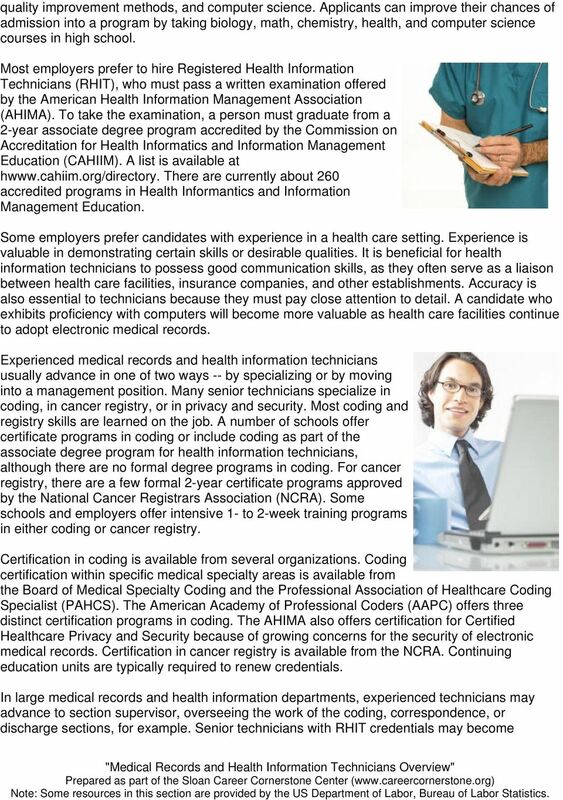 Technicians who specialize in coding are called health information coders, medical record coders, coder/abstractors, or coding specialists. These technicians assign a code to each diagnosis and procedure, relying on their knowledge of disease processes. Technicians then use classification systems software to assign the patient to one of several hundred "diagnosis-related groups," or DRGs. The DRG determines the amount for which the hospital will be reimbursed if the patient is covered by Medicare or other insurance programs using the DRG system. In addition to the DRG system, coders use other coding systems, such as those required for ambulatory settings, physician offices, or long-term care. 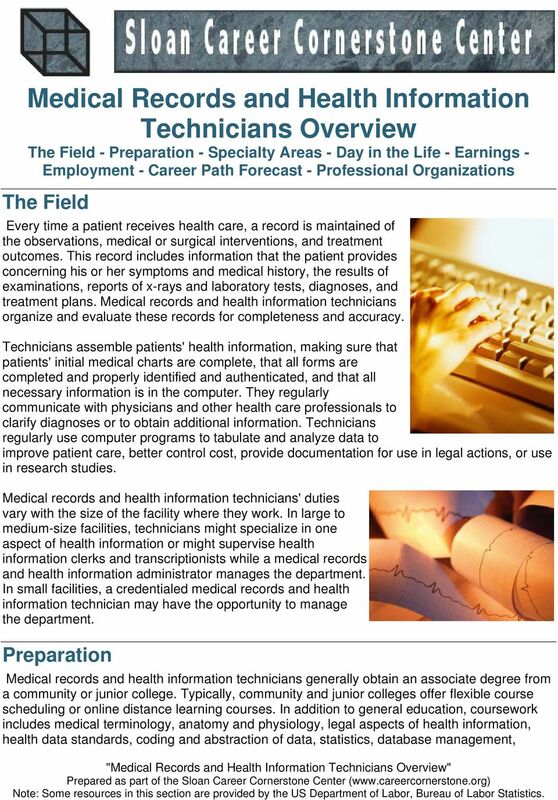 Medical records and health information technicians also may specialize in cancer registry. Cancer (or tumor) registrars maintain facility, regional, and national databases of cancer patients. Registrars review patient records and pathology reports, and assign codes for the diagnosis and treatment of different cancers and selected benign tumors. Registrars conduct annual followups on all patients in the registry to track their treatment, survival, and recovery. Physicians and public health organizations then use this information to calculate survivor rates and success rates of various types of treatment, locate geographic areas with high incidences of certain cancers, and identify potential participants for clinical drug trials. Public health officials also use cancer registry data to target areas for the allocation of resources to provide intervention and screening. Day in the Life Medical records and health information technicians work in pleasant and comfortable offices. This is one of the few healthrelated occupations in which there is little or no direct contact with patients. Because accuracy is essential in their jobs, technicians must pay close attention to detail. Technicians who work at computer monitors for prolonged periods must guard against eyestrain and muscle pain. PUBLIC COPY, and Immigration. invasion of personal privacy. identity 1 kt,!. :'.. k~~fltd U, prevent cleai r j L;L. -@ U. S. Citizenship. 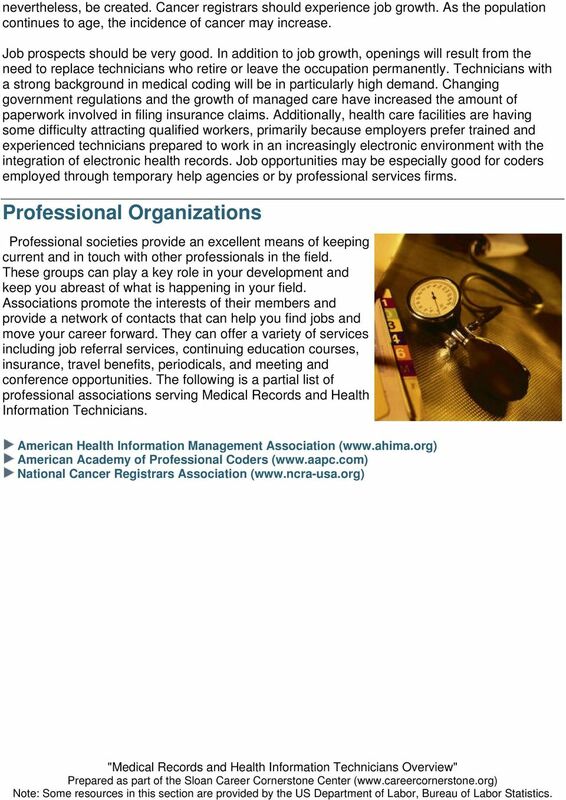 A medical coding specialist is a member of the medical records billing department who aids in insurance reimbursement. MEDICAL CODING FROM HOME How to Get Started in the Lucrative Medical Coding Field ALL RIGHTS RESERVED. AFFILIATE DISCLAIMER. This report has affiliate accounts for products that complement this report. WHAT IS CODING & UNDERSTANDING THE DIFFERENCE BETWEEN CCA, CCS, CPC. Julie A. Shay, RHIA HIT Program Director 352-395-5024 Julie.shay@sfcollege. Preparation iagnostic Medical Sonographer Overview"
PAGE 1 OF 5 Cancer registrars ensure that timely, accurate, and complete data are maintained on all types of cancer diagnosed and/or treated within a health care institution or within a defined population. If you have not applied to the college yet, please pay particular attention to the section on applying to Austin Community College. Please complete all sections with an emphasis on items 7, 8, 9 and 10. The ATP is not to exceed 5 pages. Make a Difference! Discover a Career in Healthcare Management!